Check out your antenna's SWR with the internal SWR analyzer. 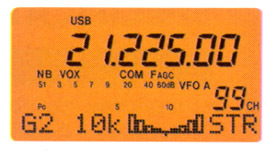 The resolution of the IC-703's SWR graph bandwidth is adjustable to these ranges: 10, 50, 100 and 500 kHz. Copyright 2002-2011 Universal Radio, Inc.